In order to perform calculation with the cluster-expansion method exciting uses the Alloy Theoretic Automated Toolkit (ATAT) package. You can find the complete ATAT package in the directory $ATATROOT. In order to install the package, you have to execute the following commands. If no error message appears, proceed with the next step. Now, the ATAT package is available to be used. In order to install the ATAT@exciting tool, you should use the following command. Note that in this case it is not relevant the directory where you are actually typing the command ezexciting. The physical processes determining the free energy of an alloys take place on very different time scales. Especially, electronic excitations, magnetisation, and changes in the atomic positions take place on a much faster time scale compared to atoms changing their position on the lattice. Therefore, the faster mechanisms can either be treated implicitly as part of the configuration, or neglected. This way, the total energy becomes a function of the configuration, only. So the point of interest is: How can one obtain the effective cluster interactions? The answer is: By calculating special, ordered structures ab initio, and then fitting the ECIs for a suitable set of clusters to ab-initio total energies. The cluster-expansion method is implemented in the MIT Ab-initio phase-stability (MAPS) code maps of ATAT, which can be interfaced with the exciting software package. A set of scripts and programs called ATAT@exciting does the connection between ATAT and exciting. proposes new structures to be calculated in order to improve the cluster expansion. 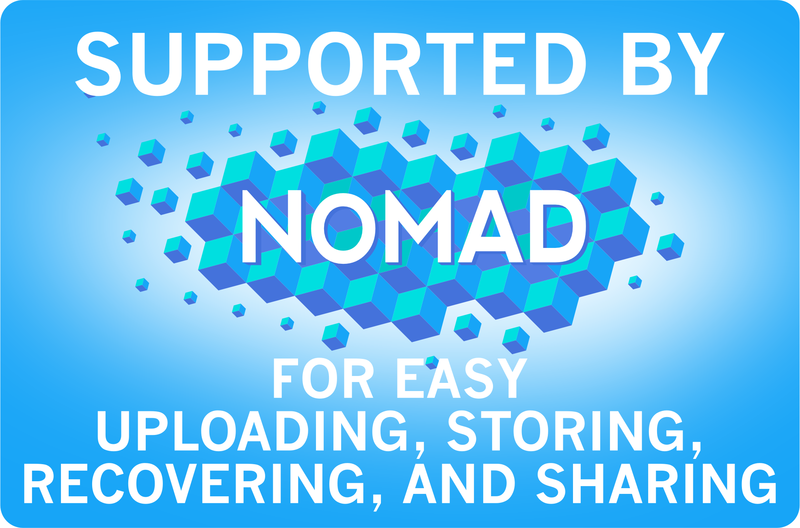 communicate with maps via signal files (ready, wait, energy, or error). Finally, exciting determines groundstate total energies for the structures produced by maps. This section follows to a large extend parts of the ATAT manual, adapted to the specific situation of this tutorial. The original ATAT manual can be found as $ATATROOT/doc/manual.pdf. lat.in: Describes the lattice type, atomic positions, and which elements are allowed to "sit" on each site. Further information on this file is found here. Al.lat.in: Lattice vectors of pure Al. Ti.lat.in: Lattice vectors of pure Ti. to observe that a directory 0 has been created. This directory contains initially the files str.out and wait. The first file describes the structure for which the energy needs to be calculated. The latter file, wait, is just a flag that allows you to find the newly created directory, and may be removed after appereance. Now, press the enter key and remove the file 0/wait. You can repeat the complete procedure (touch ready, etc.) to add more structures. maps will update the current cluster expansion every time a new energy becomes known. By using the tee command after maps, the output is written both to the display and the file maps.out. While maps automatically creates the file that describes the geometry of a structure (called n/str.out, where the directory name n is typically a number between 0 and 10000), we need to provide a file containing all the other parameters needed by the first-principles code. In the case of ATAT@exciting, this file is named exciting.wrap. Copy the file $EXCITINGATAT/exciting.wrap to your working directory. write the value of the total energy into the file energy (after converting it from Hartree to eV). If error messages appear, consult the chapter Troubleshooting in the ATAT manual. If no error messages appear, you are ready for doing a complete cluster expansion with ATAT@exciting! Go back to the main directory of the last example. For doing a quick calculation, do the following modifications in exciting.wrap. Change the parameter kppra to 125. This way you specify that the k point density should correspond to a mesh of ngridk="5 5 5" in the 1-atom unit cell. Include the attribute rgkmax="6.0" in the groundstate element. However, before stopping the execution, let's have a look at the running calculation as explained in the next section. While the calculations are running, you can check on the status of the best cluster expansion obtained so far. The file maps.log contains a brief description of the status of the calculations, including the accuracy of the cluster expansion and various warning messages (see a list of examples of messages at the end of this section). Most of the messages pertain to the accurate prediction of the so-called "ground states of the alloy system". Ground states, which are the structures that have the lowest energy for each given concentration, are extremely important to be predicted accurately, because they determine which phases appear in the phase diagram. The maps code also outputs quantitative data in various output files. For details see the section Output files of the ATAT manual. This command displays a series of plots (to proceed from one figure to the next, close the current figure and press the entry key on the command line). All energies are in eV, and the concentration corresponds to "x" in the chemical formula TixAl1-x. Since maps performs a new (trial) cluster expansion and produces new files each time a new energy file is ready, also check_maps will deliver new plots at each such instance. Thus, it may be interesting to run check_maps every 2-3 minutes, to see how the cluster-expansion is progressing. Examples for the most important plots are displayed in the following. 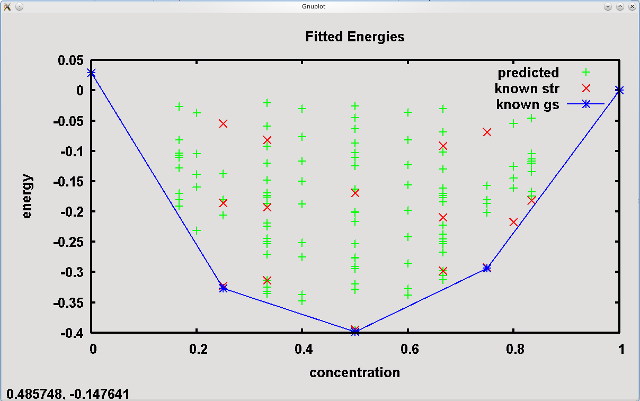 The formation energies predicted from the cluster expansion. Structures of known energy, i.e. structures where a corresponding ab-initio result exists, are marked with +. 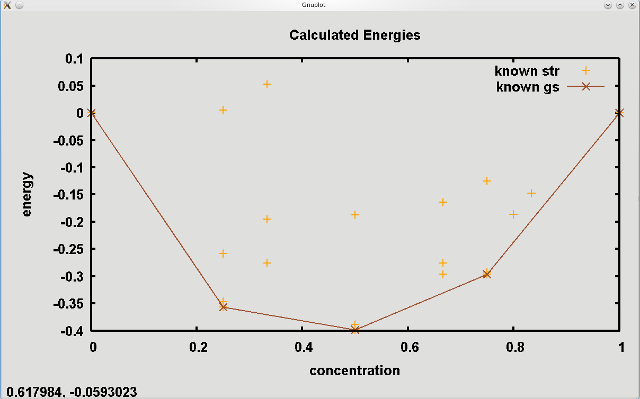 In addition, the predicted energy of all structures maps has in memory are displaced (marked with x.). The convex hull of the ground states among structures of known energy is overlaid. If new ground states were predicted, they would be marked by a blue “*"symbol. (Note that this ground state line is only meaningful if the maps.log file contains “Among structures of known energy, true and predicted ground states agree.”). A plot of the magnitude of Effective Cluster Interactions (ECI) as a function of the diameter of their associated cluster (defined as the maximum distance between any two sites in the cluster). Pairs, triplets, etc. are plotted consecutively. This plot is useful to assess the convergence of the cluster expansion. 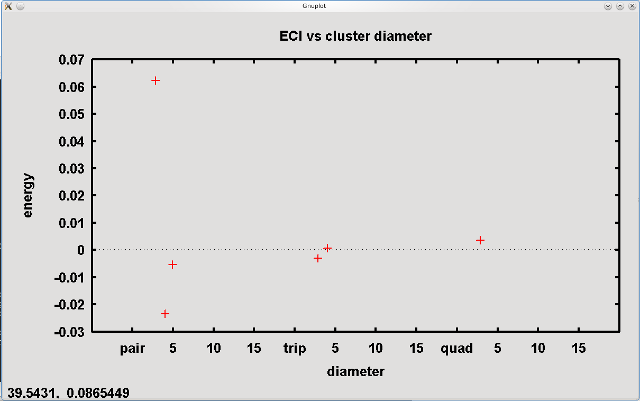 When the magnitude of the ECI for the larger clusters has clearly decayed to a negligible value (relative to the nearest-neighbor pair ECI), this is indicative of a well-converged cluster expansion. 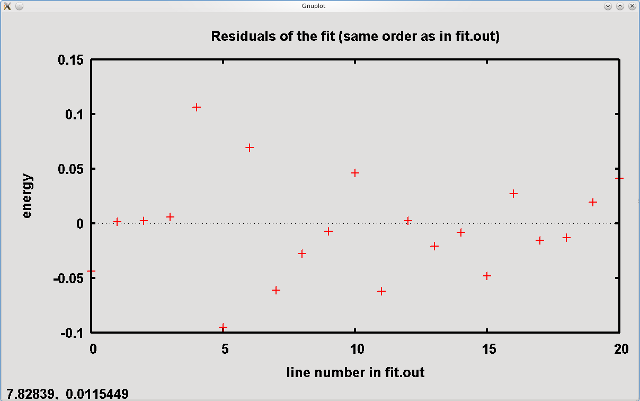 A plot of the residuals of the fit (i.e., the fitting error) for each structure. This information is useful to locate potential problems in first-principles calculations. Indeed, when first-principles calculations exhibit numerical problems, this typically results in calculated energies that are poorly reproduced by the cluster expansion. Among structures of known energy, true ground states differ from fitted ground states. The current cluster expansion incorrectly predicts which structures have the lowest energy for given concentrations, among structures whose first-principles energy is known. The code has built-in checks to avoid this. However, in rare instances, it may be mathematically impossible to satisfy all the constraints that the code imposes for a cluster expansion to be acceptable. This problem becomes increasingly unlikely as the number of calculated structural energies increases, so the user should just wait until the problem fixes itself. No other ground states of n atoms/unit cell or less exist. The energies of all ground states predicted by the cluster expansion have been confirmed by first-principles calculations. Because it can be computationally intensive to perform a full groundstate search when interactions extend beyond the nearest-neighbor shell, maps uses a search algorithm that merely enumerates every possible structures having n atoms or less per unit cell and uses the cluster expansion to predict their energies. The upper limit n increases automatically as calculations progress. The maps.log file also contains two other pieces of information. the name (=directory) of the structure. After this action, maps will not take into account this structure any more when doing the next cluster expansion. All ground states are correctly reproduced and no new ground states are predicted. In this case, the file maps.log would then indicate that "Among structures of known energy, true and predicted ground states agree. No other ground states of n atoms/unit cell or less exist". The crossvalidation score, as given in the maps.log file, is small (typically less than 0.025 eV). Optionally, it is instructive to verify that the magnitude of the ECIs decays both as a function of the diameter of the corresponding cluster and as a function of the number of sites it contains, using the check_maps command described above. name (=directory) of the structure. Note that the file gs.out is changing as long as the cluster-expansion is not converged/still in progress. set the attribute rgkmax="7.0" in the groundstate element. This will start a new cluster-expansion run, yielding more reliable results. The run will take a couple of hours, until a reasonable number of structures is calculated and the cluster expansion converges.